First things first: What is the best selling Girl Scout Cookie? Want to take a guess at it? The big reveal — and the part where I get philosophical — after the jump. According to the FAQ section of the Girl Scouts of America website, the top Girl Scout cookies are Thin Mints, accounting for 25% of sales. They’re followed by Samoas (not “Samoans,” as I’ve heard them called too many times) at 19% and peanut butter Tagalongs at 13%. If you are unsatisfied with your purchase for any reason, the site recommends you contact your local Girl Scout chapter for assistance. You should also call them if your Girl Scout hasn’t received her cookie-selling badge, as while “the national Girl Scout organization will be glad to listen…all decisions concerning cookie activities are made by your local Girl Scout council.” Emphasis added, enthusiastically. 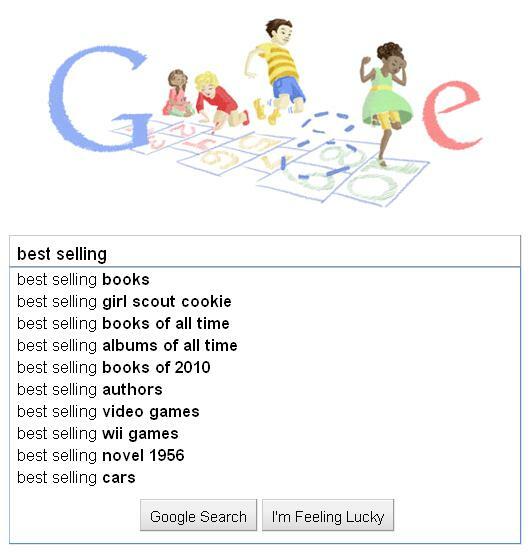 You may think, as I did, that the Thin Mint/Samoa debate is a surprise high-placer in this Google Top Ten, but that it’s nowhere near as curious as the strangely specific search for the best selling novel in 1956. What’s so special about that year? Why do so many people want to know? A quick check of the results confirmed my hypothesis: a stumper of a clue in the New York Times crossword. In fact, I now remember doing this puzzle. I was on a plane to St. Louis for the wedding of a dear friend. Neither our other friend — whose magazine it was — nor the groom’s Aunt several rows ahead came up with the cheeky answer: P8ton Place. And you know what? That’s how it ought to go sometimes. Sometimes you don’t know the best selling novels of 1956. And neither does your friend. And nor do you or your friend’s aunt realize that the puzzle’s theme clues all use the number 8 in their answers. And that’s OK. Next week you’ll see what you missed. The suspense is part of the fun — and frustration. Or at least it is while you’re stuck on an airplane 35,000 feet up with no internet access. Because down here on the ground the pull of the web is strong. A world of answers entices you, challenges your definition of cheating, your faith in yourself, your intellectual limits. Gone are they days that once you’ve polled everyone in the vicinity for an eleven-letter word for “sparkle” — starts with S, blank, blank, blank, blank, blank, L, L blankblankblank — without thinking of “scintillate” you’re screwed. There’s always a way to figure it out with the help of a search engine. No longer must we accept our own limitations and those of our friends and families (and friends’ families). Which is too bad, because humility is a virtue. (Patience used to be a virtue, too, by the way. But surely the computer age has rendered that one obsolete.) Furthermore, the ease and quickness of taking a quick peek online may tempt us to compromise our principles, those nagging cerebral codes which tell us that we’re above flipping to the answer page. There’s value to doing things the old fashioned way. Moreover, there’s honor in it. And though it may sound corny, like something Daniel Stern would say at the end of an episode of the Wonder Years, it is more rewarding to get near the finish line on your own merits than to cross it on someone — or something — else’s. This entry was posted in Google Game and tagged cookies, crossword puzzles, girl scouts, Google Game, word games. Bookmark the permalink.